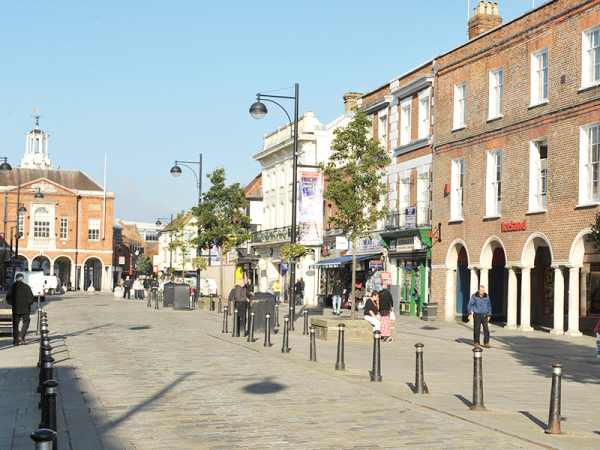 High Wycombe was once famous for its chair-making industry and known as 'the furniture capital of England'. Set in a steep valley, it has a pedestrianised Georgian High Street, the Little Market House - or 'Pepper Pot' - designed by Robert Adam, as well as a handsome, arcaded Guildhall. Behind the Market House is the 12th Century parish church, the largest in the county, and beyond that is Wycombe Museum. East of the town is The Rye, a wide expanse of grassland bounded by beech woods. High Wycombe is a thriving market town with market days on Tuesday, Friday and Saturday and also has the ever-expanding shopping and leisure experience known as the Eden Shopping Centre bringing many new retail brands into the town. The ancient ceremony of 'Mayor Making' still takes place in the town each May, in which the Mayor and Charter Trustees are weighed to see if they are getting fat at rate payers' expense, although the Mayor’s actual weight is never revealed, the gain or loss is. The Wycombe Swan Theatre presents audiences with the finest in local, national and international companies and performers. You can also visit High Wycombe's first brewery since 1931, Fisher's Brewery. Located behind Morrisons, you can pop by to sample and buy locally produced craft beers from Wycombe's very own microbrewery. Download the High Wycombe mini guide here.